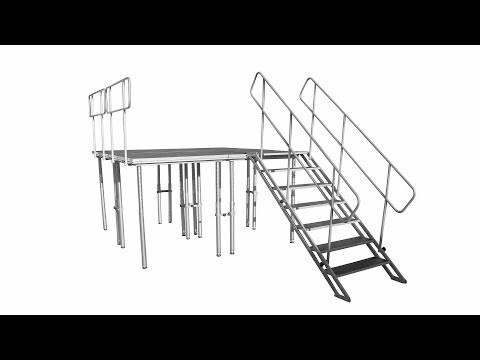 The ProX XSQ-4X4 Heavy Duty Platform Series is a convenient transportable staging solution that built tough and designed for maximum durability and safety. Engineered to minimize your set up time and effort with industry leading design, materials and precision production process. The XSQ-4X4 Platform is a single side, indoor and outdoor, weather-resistant, portable staging platform. The ProX XSQ-4X4 is designed to be fully field repairable, and works with all StageQ supports from ProX. Each stage platform includes four adjustable telescoping legs that adjust from 28" to 48". These legs make it possible to quickly and precisely adjust the stage height. The non-slip textured laminated surface is built to hold up against the most demanding conditions. They are built to last and carry the ProX Limited Lifetime Warranty. For those unavoidable accidents, repair/ replace only damaged part of platform (platform surface, side extrusion, corner piece, etc.) There is no need to replace entire platform as the units can be repaired on-site – no need to send back to factory for repair.